Behind the Screens explores this trend toward "hypercommercialism" through phenomena such as product placement, tie-ins, merchandising and cross-promotions. It combines multiple examples taken directly from the movies with incisive interviews provided by film scholars, cultural critics, political economists, and an Oscar-nominated screenwriter. Behind the Screens presents an accessible argument designed for school and college-age audiences-- precisely the demographic most prized by both Hollywood studios and advertisers alike. It features examples drawn from movies such as Wayne's World, Forrest Gump, The Lion King, Summer of Sam, and Toy Story. Interviewees include Jeremy Pikser, Oscar-nominated screenwriter of the Warren Beatty film Bulworth; Mark Crispin Miller, Professor of Communication at New York University; Susan Douglas, Professor of Communication at the University of Michigan; Professor Robert W. McChesney of the Univeristy of Illinois at Urbana-Champaign; and Professor Janet Wasko of the university of Oregon. 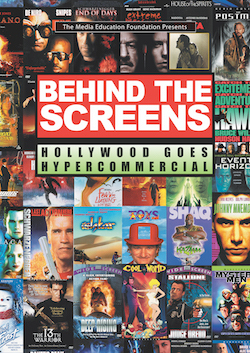 "Behind the Screens is a lively, accessible, well-argued examination of the pernicious effect of corporate advertising on contemporary popular cinema... highly recommended."